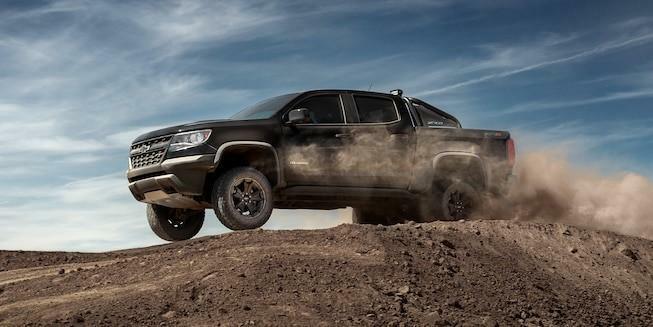 Colorado ZR2 is capable of just about anything, with everything you need to be trail-ready from day one. That includes one-touch terrain select for desert, mud or mountains that adjusts the calibration of the engine, transmission and Traction Control to enhance performance. And when the trail day ends, segment-exclusive MultimaticTM shocks offer an exceptional ride when you transition to paved roads. 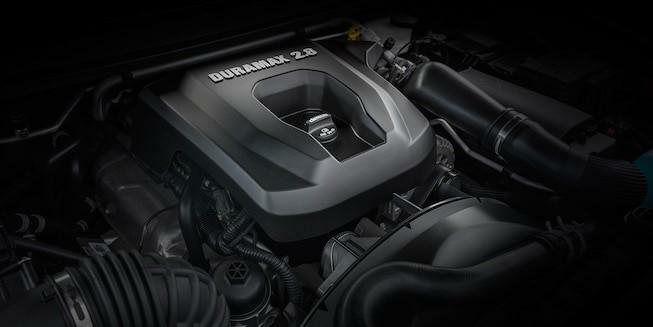 Two engine choices: an advanced 3.6L V6 with best-in-class horsepower, or the GM-exclusive Duramax® 2.8L Turbo-Diesel with best-in-class torque. Colorado is built for utility and designed for individuality. Thanks to its rugged good looks, perfect size and quiet cabin combined with all the functionality of its bed and available GearOn™ storage system†, this truck makes a statement in the city and in the country. 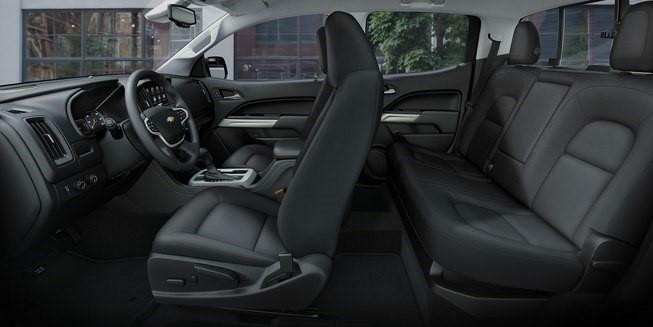 Inside, you’ll find ample storage and available creature comforts like a heated steering wheel, cloth or leather-appointed heated front seats and a Bose® sound system. 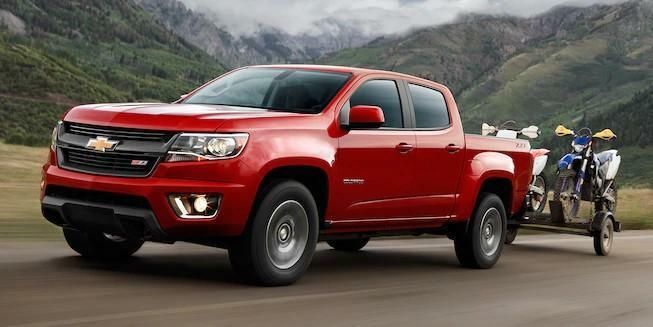 Every Colorado Special Edition is crafted to make a huge impression. Which statement will you make? Colorado Redline Edition boasts urban-inspired design with sporty Red and Black accents. Darkened aesthetics give Colorado Z71 Midnight Edition a bold sense of mystery. Colorado Custom Edition is all about getting the job done in style. Colorado ZR2 Dusk and Midnight Editions merge your dark and wild sides into one capable off-roader. 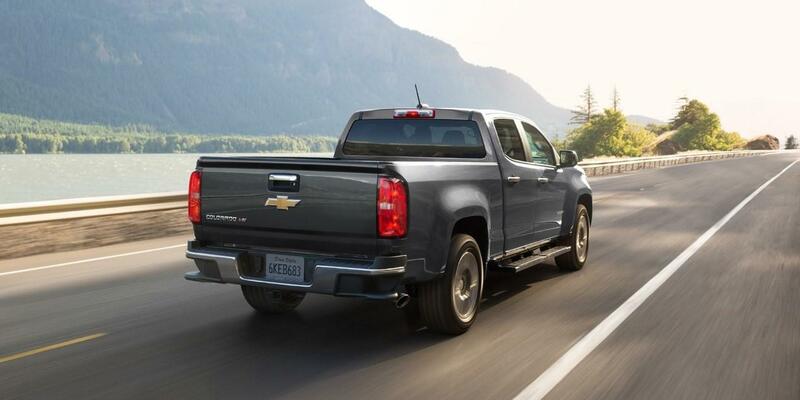 An available GM-exclusive Duramax® 2.8L Turbo-Diesel engine offers best-in-class towing power† and torque, and makes Colorado America’s most fuel-efficient midsize pickup truck†. When it comes to engines, this one goes right to the front of the class. 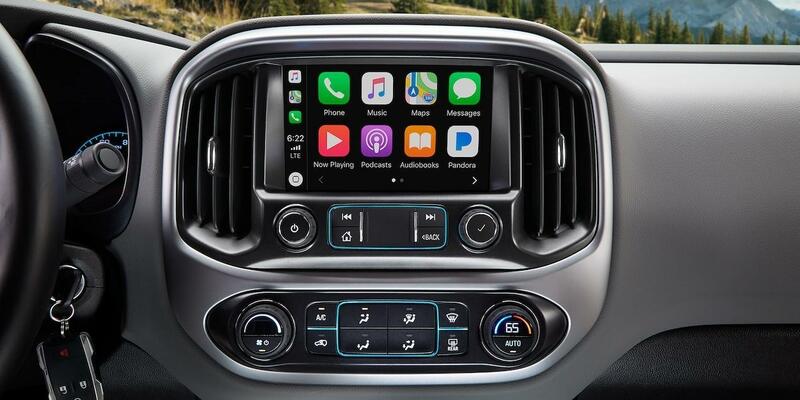 The new Chevrolet Infotainment System†, available wireless charging† and multiple USB ports† turn Colorado into your advanced digital assistant. †Safety or driver assistance features are no substitute for the driver's responsibility to operate the vehicle in a safe manner. The driver should remain attentive to traffic, surroundings and road conditions at all times. Visibility, weather and road conditions may affect feature performance. Read the vehicle Owner's Manual for more important feature limitations and information. When driving in Reverse below 5 mph, this feature provides distance-to-object alerts to help the driver park and avoid crashing into nearby objects directly behind the vehicle during low-speed maneuvering. †The Manufacturer's Suggested Retail Price excludes destination freight charge, tax, title, license, dealer fees and optional equipment. Click here to see all Chevrolet vehicles destination freight charges. † Colorado 2WD with available Duramax 2.8L Turbo-Diesel 4-cylinder engine. Before you buy a vehicle or use it for trailering, carefully review the Trailering section of the Owner's Manual. The weight of passengers, cargo and options or accessories may reduce the amount you can tow. † EPA-estimated 30 MPG highway: Colorado 2WD with available 2.8L Duramax Turbo-Diesel engine 20/30. †Service varies with conditions and location. Requires active OnStar service and paid AT&T data plan. Visit onstar.com for details and limitations. † The following trucks are eligible for Chevy Truck Legends: Avalanche, C/K Pickup, Colorado, S-10, Silverado, Silverado HD, Suburban and Tahoe. † Before you buy a vehicle or use it for trailering, carefully review the Trailering section of the Owner’s Manual. The weight of passengers, cargo and options or accessories may reduce the amount you can tow. †EPA-estimated MPG city/highway: Colorado 2WD with 2.5L 4-cylinder engine and available automatic transmission 20/26. †Requires available Z82 Trailering Package. ZR2 models have 5,000 lbs. of towing capability. Before you buy a vehicle or use it for trailering, carefully review the Trailering section of the Owner’s Manual. The weight of passengers, cargo and options or accessories may reduce the amount you can tow. †EPA-estimated MPG city/highway: Colorado 2WD with available 3.6L V6 engine and available automatic transmission 18/25. †2WD diesel models. 4x4 diesel models except ZR2 have 7600 lbs. of towing capability. ZR2 diesel models have 5000 lbs. of towing capability. Before you buy a vehicle or use it for trailering, carefully review the Trailering section of the Owner’s Manual. The weight of passengers, cargo and options or accessories may reduce the amount you can tow. †EPA estimated 20 city/30 highway MPG for Colorado 2WD with available 2.8L turbo-diesel engine based on segment exclusive features. Excludes other GM models. †Chevrolet Infotainment System functionality varies by model. Full functionality requires compatible Bluetooth and smartphone, and USB connectivity for some devices. †The system wirelessly charges one PMA- or Qi-compatible mobile device. Some devices require an adaptor or back cover. To check for phone or other device compatibility, visit my.chevrolet.com/learn for details. †Vehicle user interface is a product of Apple and its terms and privacy statements apply. Requires compatible iPhone and data plan rates apply. Apple CarPlay, Siri, iPhone and iTunes are trademarks for Apple Inc, registered in the U.S. and other countries. †Vehicle user interface is a product of Google and its terms and privacy statements apply. Requires the Android Auto app on Google Play and an Android compatible smartphone running Android 5.0 Lollipop or higher and data plan rates apply. Android, Android Auto, Google, Google Play and other marks are trademarks of Google Inc.
†Visit my.chevrolet.com/learn for vehicle and smartphone compatibility. †Always use seat belts and child restraints. Children are safer when properly secured in a rear seat in the appropriate child restraint. See the Owner’s Manual for more information. †Maintenance visit must occur within first year of vehicle delivery. Service visit consists of ACDelco Oil and Filter Change/Tire Rotation/MPVI. Does not include air filters. See participating dealer for other restrictions and complete details. †Complete Care - Whichever comes first. See dealer for details. †Standard connectivity available only to original purchaser for 10 years. Connected access services are subject to change. Does not include emergency or security services. Vehicle diagnostics capabilities vary by model and plan. Message and data rates may apply. Requires contact method on file and enrollment to receive alerts. Not all issues will deliver alerts. See onstar.com for detail and limitations. 1. Excludes base models. Offer includes price reduction below MSRP and cash allowance. Must be a current owner of a 2005 model year or newer non-GM vehicle for at least 30 days prior to the new vehicle sale. Not available with special financing, lease and some other offers. Take new retail delivery by 4/30/19. See participating dealer for details. 2. Based on MSRP $38,590. Not available with special financing, lease and some other offers. Take new retail delivery by 4/30/19. See participating dealer for details. Must be a current lessee of a 2014 model year or newer non-GM vehicle for at least 30 days prior to the new vehicle sale. Customer remains responsible for current lease payments. Example based on national average vehicle selling price. Each dealer sets its own price. Your payments may vary. 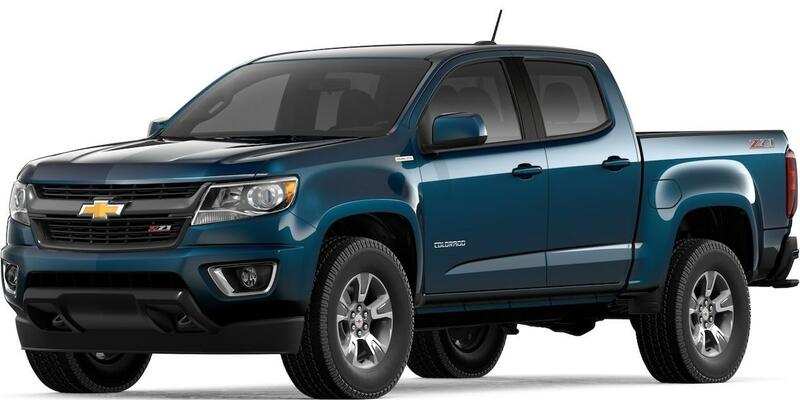 Payments are for a 2019 Colorado Crew Cab Short Box WT 4WD V6 Engine with an MSRP of $35,230. 36 monthly payments total $8,954.28. Total lease cost is $11,484.28. Lease based on net capitalized cost of $28,799.88 including down payment of $2,530.00 and $3,000 in applied incentives. Payments may be higher in some states. Option to purchase at lease end for an amount to be determined at lease signing. GM Financial must approve lease. Lessee pays for maintenance, excess wear and a disposition fee of $395 or less at end of lease. Not available with some other offers. Residential restrictions apply. Take new retail delivery by 04/30/2019. See dealer for details.